What class/es did you take, and what classes are you currently taking? I took one of Andy’s painting classes, and I took Drawing at the Met and in Central Park. Now I am in Jake's acrylic class on Sundays. It’s the best part of my week. What makes your experience at The Art Studio NY unique and memorable? The people in class and the staff. It’s a very laid back environment that embraces everyone’s artistic abilities. What is something you have achieved because of your art classes that you never thought you could? I never thought I would actually get better at painting and I have! Jake has encouraged me to take risks and I do. He’s encouraged me to be more independent and I am. I never considered myself an artist, and I guess it’s safe to say that I am. What are you most proud of when it comes to your artistic journey? I remember after my first painting, I asked Jake if I should paint a portrait, and he said I could but he also explained that portraits are really difficult because you really need to know your subject to be able to capture their personality. I decided to paint a portrait of my grandma and mom for a Mother’s Day gift and after completing it, I was SO PROUD!!! I was hooked on portraits and LOVING black and white! What fears have you overcome, on and off the canvas, since starting to paint? I’m not afraid of anything except cockroaches and ocean waves cause I can’t swim. Still afraid of both. As far as painting is concerned, I used to be afraid to mess up. I am not anymore. Because, I can paint over anything. And I have the BESTEST teacher in the world who can turn anyone into an artist. How have your art classes allowed you to relax and relieve stress? YES, but mostly they make me happy. The art studio is one of my happy places. How have your art classes changed your life, either in your art or your everyday life? Yesssssssss art is a great gift. It’s nice to be inspired by someone’s photo, another artist or a teacher, and it's nice to be admired for something creative that you’ve done. What advice would you tell a total beginner who feels afraid of taking an art class or they feel they "have no talent"? Everyone has talent, you just can’t be afraid to express you ART and soul. Hobbies including everything from cardio classes to crocheting can increase people’s sense of mental well being and boost brain health. Such activities have additional advantages for people in addiction recovery who might be searching for productive ways to spend their time. And, whether your primary goal is socializing or sweating, experts agree hobbies help reduce stress while increasing your sense of satisfaction. Need help picking a pastime? Consider taking a community college class to experiment with something you’ve always found interesting but never taken the time to try. Or, search the events calendar at your local library to find a sewing circle or sci-fi book club to join. Meanwhile, here are a few suggestions to get your search started. Art therapy has been used to treat substance use disorders since the 1950s and has several documented benefits including providing people an outlet for communication and reducing resistance to alcohol treatment programs. But art doesn’t have to be created in a structured setting to be therapeutic. Research shows that activities including painting, sculpting, drawing, and photography can lower stress levels and leave people feeling more mentally focused, according to an article published by Be Brain Fit. In fact, amateur artists might find themselves so engrossed in an endeavor that they achieve a state of flow, a meditative-like mindset that temporarily pushes aside everything except what they’re working on at the moment -- a plus for anyone in today’s age of information overload. Growing your own food is a great way to get more in touch with what you put in your body. Gardening is also a fruitful form of outdoor exercise. And, if you don’t have a space of your own to sow seeds, consider community gardens, which are sprouting up all over the country. Investing some sweat equity at one could reap rewards including new friends and, of course, fresh fruits and vegetables. Gardening could also inspire many to move to the next link in the food chain. Once you’ve harvested the results of your hard work, why not whip up something new and interesting with the fresh-picked produce? Doing your own cooking is an excellent recipe for improving your health. Many recovering addicts find yoga and tai chi particularly helpful for bringing their minds and bodies into balance. Sessions are as meditative as they are physical because they encourage practitioners to focus their minds on their movements. Plus, both forms of exercise are easily adaptable depending on an individual’s fitness level and can be practiced almost anywhere with little or no equipment. An article on the Rewire Me website recommends volunteering as a healthy habit to adopt during recovery. Helping others will boost your sense of empathy -- and empowerment -- by giving you an outlet to make a positive difference in the world. If logistics prevent you from volunteering in person, consider ways you can use the time and resources you have. For instance, there are virtual volunteer activities that connect people with worthy causes nationwide. You could craft handmade blankets for homeless people in Dallas or review scholarship applications for a nonprofit educational foundation, just to name a few. No matter what activities you enjoy, hobbies can help decrease stress and improve your mental and physical well-being. So whether you spend your free time painting portraits or striking yoga poses, these pleasant pursuits will help keep you happier, healthier, and focused on the future. Jenny Casey is one of our very incredible students at The Art Studio NY. 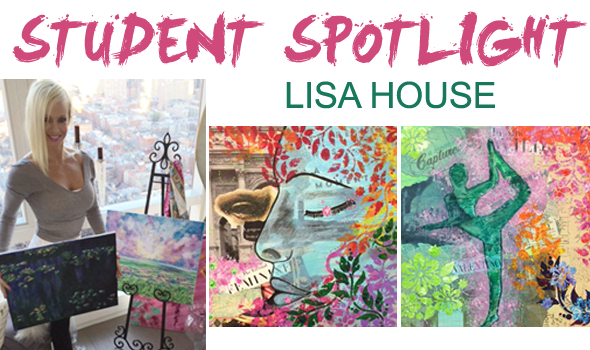 She exhibits her artwork in New York, and is currently taking Painting For The Next Level with instructor Edward Holland. It's never too late to start creating! If you haven't picked up a paintbrush in 20 years, don't fret. Art classes are meant to be safe spaces to explore, create, and let go! Pick your favorite medium - oil painting, pastels, acrylic, or pencils!